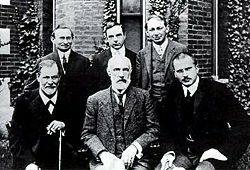 Jones, middle of the back row, with Freud, Carl Jung, Sandor Ferenczi and others in front of Clark University in 1909. Alfred Ernest Jones (January 1, 1879 – February 11, 1958) was a Welsh neurologist and psychoanalyst of the Freudian school. He contributed to the development of psychoanalysis through his introduction of the concept of "rationalization" as a way people deal with unconscious motivations. He also served as Sigmund Freud’s official biographer. As the first English-language practitioner of psychoanalysis and as president of both of the British Psychoanalytical Society and the International Psychoanalytic Association in the 1920s and 1930s, Jones exercised unmatched influence in the establishment of its organizations, institutions, and publications in the English-speaking world, a position of great import given the revolutionary impact of Freud's work on human society in the twentieth century. Alfred Ernest Jones was born in Gowerton, an industrial village on the outskirts of Swansea, in South Wales, Great Britain. The son of a colliery engineer, he was educated at Swansea Grammar School, Llandovery College, University College Cardiff and University College London where in 1901 he obtained a degree in medicine, followed by a doctorate and membership of the Royal College of Physicians in 1903. He was particularly pleased to receive the University’s gold medal in obstetrics from his distinguished fellow Welshman, Sir John Williams. Unfortunately for Jones, Edwardian England turned out to be less than receptive to revolutionary theories of human sexuality. In this context Jones’ early attempts to employ psychoanalytic insights in his clinical work proved less than circumspect. In 1906 he was tried and acquitted over allegations of improper conduct with pupils in a London school. In 1908, having demonstrated sexual repression as the cause of a hysterical paralysis of a young girl’s arm, he faced allegations from the girl’s parents and was forced to resign his hospital post. In facing these tribulations Jones was able to call on the emotional and financial support of his mistress Loe Kann, a wealthy Dutch émigré whom he had first met in London in 1906. Their relationship came to an end in 1913 and Kann entered analysis with Freud, and Jones with Sandor Ferenczi. In 1917, Jones married the Welsh composer Morfydd Llwyn Owen. She died eighteen months later following complications from surgery for appendicitis. In 1919 in Zurich, Jones met and married Katherine Jokl, a Jewish economics graduate from Moravia who had been at school in Vienna with Freud’s daughters. They had four children and remained happily married. Always proud of his Welsh origins, Jones became a member of the Welsh Nationalist Party - Plaid Cymru. He had a particular love of the Gower Peninsula, which he had explored extensively in his youth and which became a regular family holiday retreat for the Jones family. He was instrumental in helping secure its status in 1956, as the first region of the UK to be designated an Area of Outstanding Natural Beauty. Jones was made a Fellow of the Royal College of Physicians in 1942 and an Honorary Doctor of Science at Swansea University in 1954. He died on February 11, 1958, in London, England. While attending a congress of neurologists in Amsterdam in 1907, Jones met Carl Jung from whom he received a first-hand account of the work of Freud and his circle in Vienna. Confirmed in his judgment of the importance of Freud’s work, Jones joined Jung in Zurich to plan the inaugural Psychoanalytical Congress. This was held in 1908 in Salzburg, where Jones met Freud for the first time. In a paper given to the congress, Jones introduced the term "rationalization," to indicate the way people try to make sense of their unconscious motivations by rationalizing them. Freud later accepted the term and it became a part of the technical language of psychoanalysis. Jones then traveled to Vienna for further discussions with Freud and introductions to the members of the Vienna Psychoanalytic Society. Thus began a personal and professional relationship which, to the acknowledged benefit of both, would survive the many dissensions and rivalries which marked the first decades of the psychoanalytic movement, and would last until Freud’s death in 1939. With his career prospects in Britain in serious difficulty, Jones sought refuge in Canada in 1908 in the post of psychiatric consultant at the Toronto General Hospital. There followed appointments as assistant professor and then professor at Toronto University. During his time in Canada, Jones was able to forge strong working relationships with the nascent American psychoanalytic movement. In 1911 he founded the American Psychoanalytic Association, serving as its first Secretary until 1913. During this period Jones produced the first of what were to be many significant contributions to psychoanalytic literature, notably his monograph on Hamlet later published as Hamlet and Oedipus (1949). On his return to London in 1913 Jones set up in practice as a psychoanalyst, founded the London Psychoanalytic Society and continued to write and lecture on psychoanalytic theory. A collection of his work was published as Papers on Psychoanalysis (1912), the first book to be published on psychoanalysis in the English language. By 1919, the year he founded the British Psychoanalytical Society, Jones could report proudly to Freud that psychoanalysis in Britain “stands in the forefront of medical, literary and psychological interest” (letter; January 27, 1919). As President of the Society—a post he would hold until 1944—Jones secured funding for and supervised the establishment in London of a Clinic offering subsidized fees and an Institute of Psychoanalysis, which provided administrative, publishing, and training facilities for the growing network of professional psychoanalysts. Jones went on to serve two periods as President of the International Psychoanalytic Association from 1920 to 1924 and 1932 to 1949. In 1920 he founded the International Journal of Psychoanalysis, serving as its editor until 1939. The following year he established the International Psychoanalytic Library, which published some 50 books under his editorship. Jones soon obtained from Freud exclusive rights to the English translation of his work. The first two of the twenty-four volumes of the Standard Edition of Freud’s Collected Works appeared in 1924, translated by James Strachey under Jones’ supervision. Largely through Jones’ energetic advocacy, the British Medical Association officially recognized psychoanalysis in 1929. The BBC subsequently removed him from a list of speakers declared to be dangerous to public morality and in 1932 he gave a series of radio broadcasts on psychoanalysis. After Hitler took power in Germany, Jones helped many displaced and endangered German Jewish analysts to resettle in England and other countries. Following the annexation of Austria in 1938, he traveled to Vienna at considerable personal risk, to play a crucial role in negotiating and organizing the emigration of Freud and his circle to London. After the end of the war, Jones gradually relinquished his many official posts while continuing his psychoanalytic practice, writing, and lecturing. The major undertaking of his final years was his monumental account of Freud’s life and work, published to widespread acclaim in three volumes between 1953 and 1957. In this he was ably assisted by his German speaking wife who translated much of Freud’s early correspondence and other archive documentation made available by Anna Freud. An uncompleted autobiography, Free Associations, was published posthumously in 1959. Ernest Jones was a key figure in introducing the study of psychoanalysis into the English-speaking world. He translated many of Freud’s works into English and actively promoted his works in Great Britain and United States. He introduced the term “rationalization” into the standard language of psychoanalysis. Jones, Ernest A. 1912. Papers on Psycho-Analysis. London: Balliere Tindall & Cox. Jones, Ernest A. 1923. Essays in Applied Psycho-Analysis. London: International Psycho-Analytical Press. Jones, Ernest A. 1959. Free Associations: Memories of a Psycho-Analyst. London: Hogarth Press. Ernest Alfred Jones BookRags.com. Retrieved January 15, 2008. This page was last modified on 2 April 2008, at 10:01.